Dr Raymond V. Damadian would probably be too humble to accept the title ‘super-scientist’ but the many people whose lives have been saved by the MRI (magnetic resonance imaging) scanning technology he developed might think otherwise. 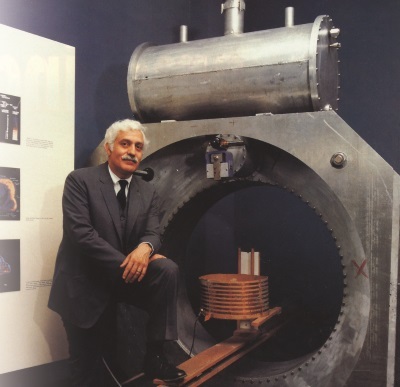 Dr Damadian with the history-making prototype of his MRI scanner. The first MR image of a human skull was made with this scanner on July 3, 1977. The prototype is now on permanent display at the Smithsonian Institution‘s Hall of Medical Sciences. Click for larger view. Hailed as one of the greatest diagnostic breakthroughs ever, this technique, using advanced principles of physics and computing, lets doctors visualize many organs and their diseased parts without the risks of exploratory surgery or the radiation associated with traditional scanning methods. Dr Damadian’s invention has earned him several top awards, including the United States’ National Medal of Technology, the Lincoln-Edison Medal, and induction into the National Inventors Hall of Fame alongside Thomas Edison, Alexander Graham Bell and the Wright brothers. 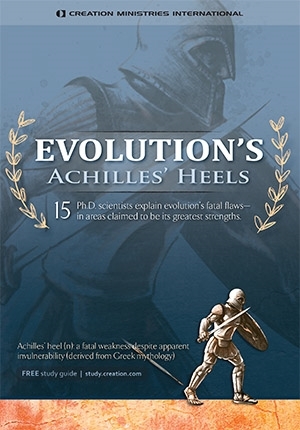 A Bible-believing Christian, this great inventor is convinced of the scientific truth of Genesis creation and its foundational importance to church and society. 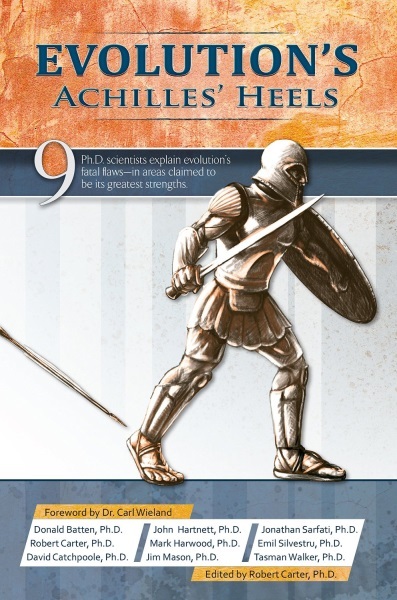 Despite his fame, however, life has had its difficulties for this revolutionizer of medicine. First, there were the years of hard work against much opposition and many doubters. His interest in the idea of MRI began when he was a young professor engaged in active scientific research at the State University of New York. Skeptics sarcastically informed him that to use the then-young technique of nuclear magnetic resonance in a medical imaging machine would mean rotating the patient at 10,000 revolutions per minute! Finally, he was granted a US patent for a functioning MRI machine. Today, MRI is a world-famous, multi-billion-dollar technology with more than 4,000 of these complex machines installed around the world. Dr Damadian told Creation magazine of how his company, formed to exploit the legal patent with great potential benefits to many Americans, experienced something extraordinary. Several huge overseas and multinational firms began manufacturing MRI scanners in spite of his patent. Dr Damadian’s small company was forced to go to court—a jury trial in 1982 found the patent to be valid and in-fringed. He had won! The happiness, however, was short-lived. For some reason the judge, six weeks after the trial, ‘voided the jury’s verdict and substituted his own.’ Dr Damadian had lost. He says that after his company had spent $2.2 million in legal fees he learned the difficulties of a ‘little fellow’ inventing a BIG product. Undaunted, his small company nevertheless carved a niche in the marketplace. However, the really huge rewards are going overseas, to companies which were not involved in the invention at all. Dr Damadian points out that this apparent injustice (shared by the inventors of such things as the laser, tetracycline, the Early Stall Warning device and many more) was even more economically damaging to the US than to himself. In reality, he says, it is just ‘a symptom of a more widespread disease afflicting our society’. He believes that America is ailing spiritually. Influenced more and more by an evolution-based humanistic education system, America is adrift of its spiritual moorings. Can such a society, with its relative ethics and increasing abandonment of God’s absolute standards revealed in the Bible, ‘continue to discern the just from the unjust?’ he asks. Will not such a society more and more forfeit the blessings which its forefathers wrought through obedience to God's Law? He quotes Russian writer Alexander Solzhenitsyn as saying ‘the strength or weakness of a society depends more on the level of its spiritual life than on its level of industrialization.’ Without the general adherence of a society to God’s laws, the most perfect governmental system cannot prevent eventual collapse. ‘Freedom’ will deteriorate to be ‘freedom to be unscrupulous’, because, says Solzhenitsyn, there is no law which can anticipate or prevent this. Dr Damadian says emphatically that his greatest scientific discovery was to find that ‘the highest purpose a man can find for his life is to serve the Will of God.’ He recently attended a major seminar at which he heard creation speaker Ken Ham calling for Americans to return to trust in the whole Word of God ‘beginning with Moses and the prophets’. 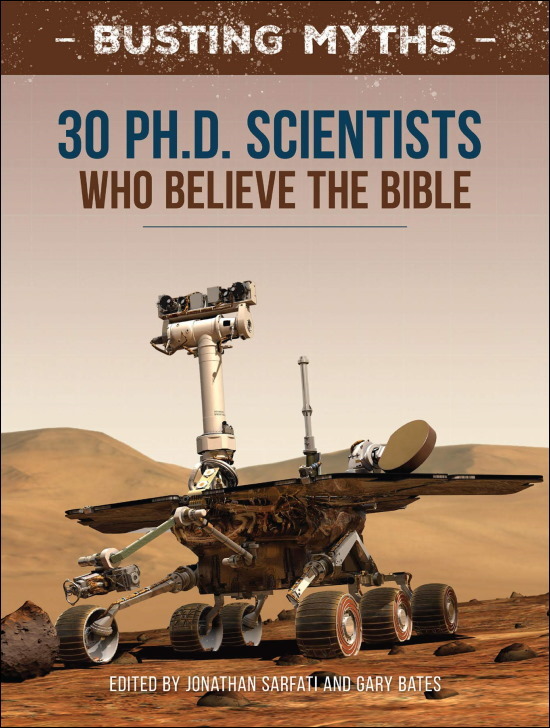 He says that he is tremendously encouraged by the creation science ministry and blessed by it, calling it ‘a courageous exposition of the truth’ and a vitally important message for America today. He believes that rejection of God’s account of Creation as the foundation for our society is basic to the spiritual, social and economic sickness of our times. We are replaying ‘the seven steps of human regression and social disintegration’ which the Apostle Paul described in Romans chapter 1 as happening subsequent to the rejection of the true God as Creator. 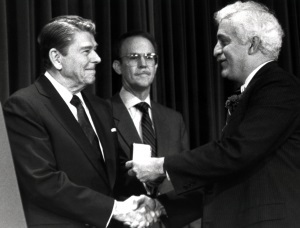 Dr Damadian with President Reagan. If Genesis cannot be accepted unqualified, what else in Scripture can be taken as the unqualified Word of God? Acceptance of the unqualified Word of God ‘has been the foundation for Western civilization since the printing of the Gutenberg Bible in the fifteenth century’, he says. This has resulted in 200 years of blessing for Western civilization, including a level of individual freedom ‘unprecedented in human history’. How does MRI scanning work? Nuclear magnetic resonance is the fundamental principle exploited by MRI scanners. The nucleus of an atom can behave like a tiny magnet since its protons are electrically charged and have a property called ‘spin’, and the neutron also has a magnetic field. The only nuclei that lack magnetic fields are those with even numbers of both protons and neutrons, because the particles pair off and cancel out each others’ field. The magnetic field causes nuclei with ‘spins’ to adopt definite quantum states, which in layman’s terms are aligning ‘with’ and ‘against’ the magnetic field. The energy gap between the states is very small even with a very strong magnet. When the body with its atoms is placed in the magnet of an MRI machine, most of the nuclei adopt the lowest-energy quantum state, or ‘aligned with’ the direction of the magnetic field. Photons, quantum packets of electromagnetic radiation, of energy matching the gap can be absorbed and cause the nuclei to switch from lower to higher energy states. Since the photon energy is proportional to radiation frequency, the radiation’s frequency must be precisely tuned, and this is in the low-energy region of the spectrum called radio waves. In the MRI machine, a radio coil wrapped around the body injects radio waves and the body’s atomic nuclei ‘answer back’ with a radio signal. The radio waves produce the signal by causing the nuclei to flip back and forth from their orientation with the field to their orientation against it. Eventually the nuclei revert to the equilibrium distribution with most back in their low energy state; how long this takes is described by the relaxation time. Dr Damadian’s key discovery was that this relaxation time was significantly longer in diseased tissues, such as animal tumours. Also, different types of body tissue had different relaxation times1. Without this discovery, MRI would not have been the very important diagnostic tool it is today, enabling non-invasive but accurate imaging of the body’s soft tissues. (See Dr Damadian’s vital contribution to MRI: Nobel prize controversy returns, for more detail). 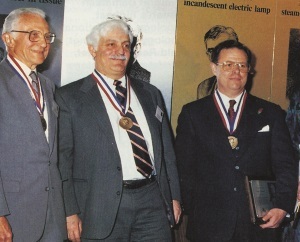 Dr Damadian, middle, an inductee at the 1989 National Inventors’ Hall of Fame. The hard part is to design a machine to ‘read’ the differing signals from differing tissues in the body (which have different ‘proton densities’—for example more or less water content) and translate this into a clearly defined image. If you have ever had to have one of these scans, you would have been asked first to make sure you had not metal objects on you. The magnetic pulse is so strong that metal objects would literally fly across the room if close to the machine. 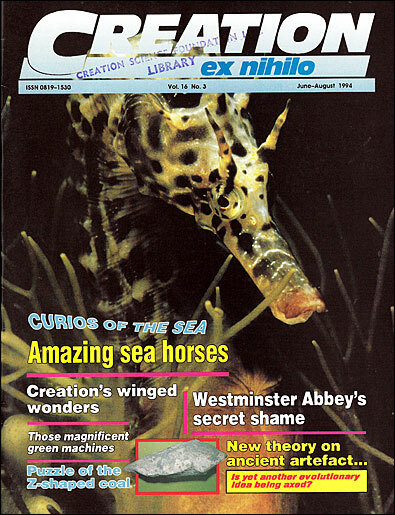 Since our article first appeared in Creation magazine, June 1994, confusion has arisen from the fact that the 2003 Nobel prize for medicine was awarded to two people—neither of them the subject of our article—for magnetic resonance imaging. A substantial controversy erupted over whether Dr Damadian was deliberately overlooked, especially in view of his well-known views on creation. The patent mentioned in this article was upheld/confirmed by the US Supreme Court in 1997, three years after our article. Raymond Damadian first filed patents on his machine following his pioneering scientific paper in 1971, which was the first time anyone had shown it was possible to use MRI to distinguish between healthy and diseased tissue. He currently holds dozens of patents which list him as the inventor. 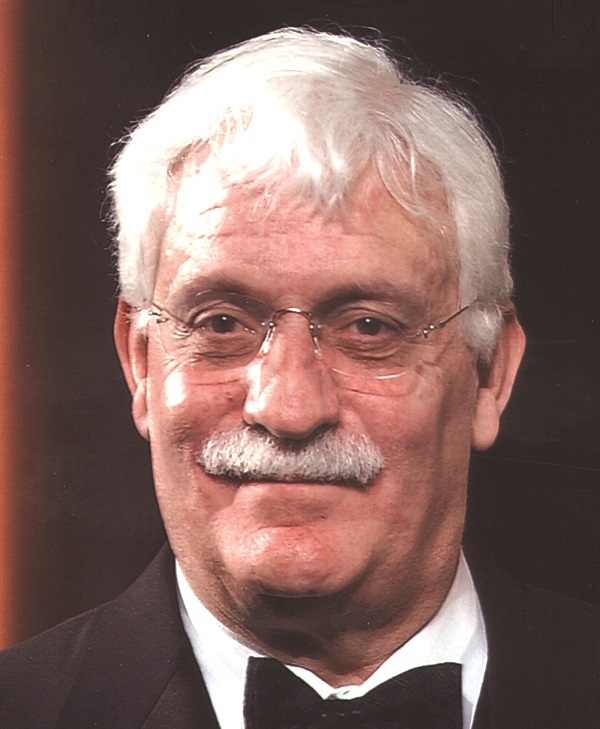 As recently as 2001, the Lemelson-MIT program bestowed its lifetime achievement award on Dr Damadian as ‘the man who invented the MRI scanner’. See also Dr Damadian’s vital contribution to MRI: Nobel prize controversy returns. Damadian, R.V., Tumor detection by nuclear magnetic resonance, Science 171(3976):1151–1153, 19 March 1971 | doi:10.1126/science.171.3976.1151. Return to text.